No matter the scope or size of your building, we can provide a swift roof replacement that looks fantastic. Tristate Roofing uses high quality products from exceptional manufacturers. Our roofing systems are energy efficient, storm resistant, and rated to last a lifetime. Have a roofing contractor provide a complimentary inspection of your roof to see if it is time for a replacement! Sometimes, you only need roof repairs to keep your home protected against the weather. However, it is important to get on those fixes as early as possible. If you see missing shingles, water damage inside the home, or even mold on the roof, give us a call. Our contractors may be able to provide an affordable solution without the need for more extensive work. Tristate Roofing is also proud to offer a range of other home exterior remodeling services. Our contractors can handle your window replacements, door installations, and new gutter installations and repairs. Our products are custom made to order for a perfect fit in your home, and to meet your ideal style preferences. Go ahead and order that bright red front entry. Pick out large picture windows. 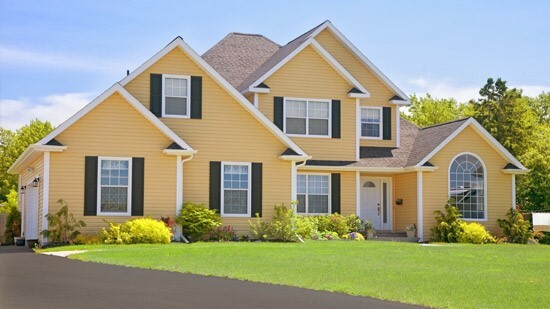 Frame your home in gutters painted a contrasting color! We guarantee your upgrades will last! When you need reliable and cost-effective home exterior services, turn to Tristate Roofing. We offer premium products from well known manufacturers that last many years. In addition, our flexible financing options make it easier to afford any home repairs and replacements. Give us a call or fill out our online form to ask us for a hassle-free, complimentary inspection and roofing quote.